Kelly McVearry, Ph.D., M.A., Ed.M. Goals: Based on preliminary data from a prospective study of children exposed in utero to antiepileptic drugs (NINDS 3RO1-NS038455-06s1), this risk assessment survey is designed to (1) identify self-enrolled IAN mothers who took 1 of 23 antiepileptic/anticonvulsant drugs during pregnancy, for any clinical condition, and (2) develop a database with improved power for generating hypotheses regarding attributable risk of autism spectrum outcomes given an exposure to anticonvulsant medication during gestation. 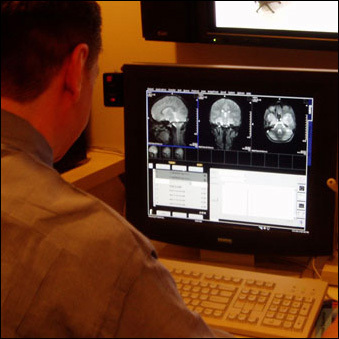 Goals: The specific aim of this project is to investigate the neurobiological bases of sensorimotor function in children on the autism spectrum, using neuroimaging procedures that include structural MRI, functional MRI, resting state blood flow and diffusion tensor imaging (DTI) in children ages 5 – 15 with autism spectrum disorders and age-matched controls. Goal: This multi-site project was a prospective clinical cohort study that investigated cognitive outcomes indicative of impaired creativity in children exposed in utero to antiseizure monotherapy. All children were born to women with epilepsy, participating via neurology departments and epilepsy centers in the Neurodevelopmental Effects of Antiepileptic Drugs (NEAD) Study. Slezicki, Cho, Yi, Brock S, Pfeiffer, McVearry K, Tractenberg R, Motamedi G, Incidence of atypical handedness in epilepsy and its association with clinical factors, Submitted to Epilepsia, Feb 2009. Meador KJ, Baker GA, Browning N, Clayton-Smith J, Coombs-Cantrell DT, Cohen M, Kalayjian LA, Kanner A, Liporace JD, Pennell PB, Privitera M, and Loring DW for the NEAD Study Group. Fetal antiepileptic drug exposure and cognitive function at age 3. New England Journal of Medicine 2009 (in press). McVearry, K, VanMeter, J, Gaillard, W, Meador, K. A prospective study of cognitive fluency and originality in children exposed in utero to carbamazepine, lamotrigine, valproate monotherapy. Submitted to DSMB, Feb 2009. McVearry, K. Brost, D., VanMeter, J., Meador, K. Environmental Toxicology and Risk Assessment for Autism Phenotypes: A Prospective Study of Children Exposed in Utero to Antiepileptic Drugs. International Meeting for Autism Researchers, London, May 2008 (Oral Paper, Abstract 2170). McVearry, K., Motamedi, G., Meador, K. Behavioral Lateralization and Prenatal Exposure to Antiepileptic Drugs: Evidence for Increased Non-Right Hand Preference. Neurobehavioral Teratology Society, 32nd Annual Meeting, Monterey, June 2008 (Poster, Oxford Abstracts: NBTS 0046). McVearry, K., Meador, K. Antiepileptic Drugs as Cognitive Teratogens: Differential Effects on Creativity in Prenatal Exposure to Valproate, Carbamazepine, and Lamotrigine, Neurobehavioral Teratology Society, 32nd Annual Meeting, Monterey, June 2008 (Oral Paper, Oxford Abstracts: NBTS 0045). Smith, S.L. (2005). Chapter, Live It, Learn It: The Academic Club Methodology (Baltimore: Brooks Publishing). McVearry, K., Hurtt, B., Walker, B., Moore, C. Tactile Defensiveness in Autism Spectrum Disorder (ASD): A Case Study of an 18 Year-old Male with Asperger’s Syndrome. Society for Neuroscience, 2004 (Abstract 14892). McVearry, K., Ehmann, C. (2001). Training Tutors Online. Journal of Technology and Teacher Education. March 2001. Smith, S.L. (2001). Chapter “Plaster Art and Painting: A Conversation with Kelly McVearry”; Section “Theoretical Underpinnings”, The Power of the Arts: Creative Strategies for Teaching Exceptional Learners (Baltimore: Brooks Publishing).